Take Kate Beaton. I vaguely thought she was too new to have a "school," but that's not correct. 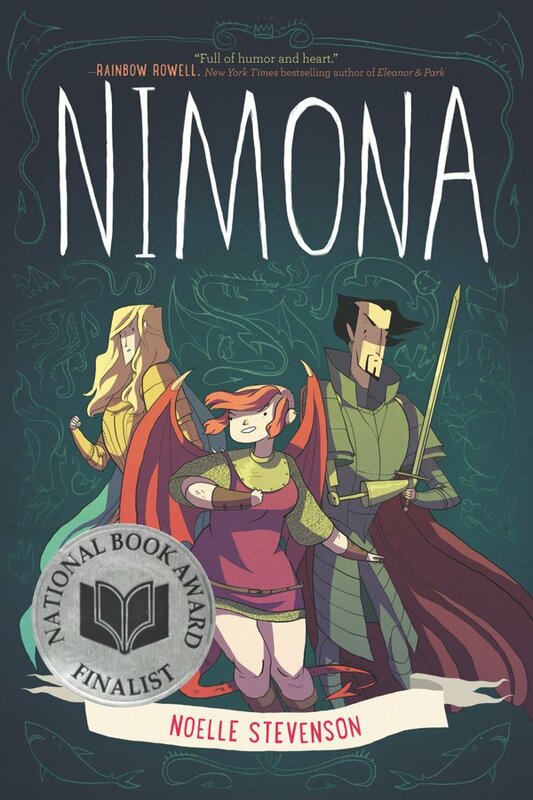 Noelle Stevenson's first major project, Nimona, is clearly influenced by Beaton's characteristic style and tone. 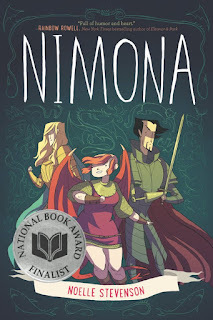 In fact, I'd say that if you like Beaton's cartoons about Joan of Arc or the Black Prince, you should make a beeline to Nimona, whose heroine is in a similar mode. Stevenson is telling a longer story, though, and Beaton is also only one touchpoint -- influence can give an initial impetus, but creating two hundred and fifty pages of comics requires new, original ideas for every page, so influences become a flavor and a tone rather than anything larger. Nimona the character is something of an enigma, a massively powerful shapeshifter who spends most of her time as an impulsive, sarcastic teenage girl. She turns up on the doorstep of Lord Ballister Blackheart, the greatest villain in this unnamed and vaguely medieval kingdom, demanding to put her massive enthusiasm to work in his cause. So they rob banks, and disrupt other things, and come up against Ballister's nemesis and oldest friend, Sir Ambrosius Goldenloin, champion of the supposedly-wonderful Institution. The worldbuilding here is somewhat slapdash and random, most likely because Nimona was originally a webcomic. When a creator works in public, often important elements happen accidentally, and get baked in to the work before all of the consequences are clear. So this kingdom is basically in the middle of nowhere, with no borders or neighbors, but does not span the world. And it's medievlaoid, except for the high technology the Institution inconsistently uses. And there's a King, but he's only mentioned in passing, and no other accouterments of government come up at all. Nimona the book is a zippy graphic novel full of snappy dialogue, with a crackerjack central character. It's reminiscent of a lot of other stories, that's true. But it's Stevenson's first book, so that's to be expected. And she does a great job working in this mode: she tells this story strongly and entertainingly. Nimona was published for teens, but its audience is wider than that. Most importantly, from the evidence of this book, Stevenson will be back, and even better next time.